Episode 23 of Bakuman is the first in a while that has referenced artistic techniques in a meaningful way. It also used what has turned out to be one of the great strengths of this show: the compression of time. As much as two months elapsed in the course of this one episode. Speeding up the boring parts! As a result this was a decent enough episode, although the series as a whole has been a bit of a let down. Aside from Koogy, the Golden Cup contestants rework their entries to make them more awesome. Each entry has a stated technique that is used to improve. Ashirogi Muto is described in the vaguest terms, the illustrations are made “more shounen“, and Shuujin states that he is improving the dialogue. Fukuda uses a different pen, which gives the line quality a different feel. 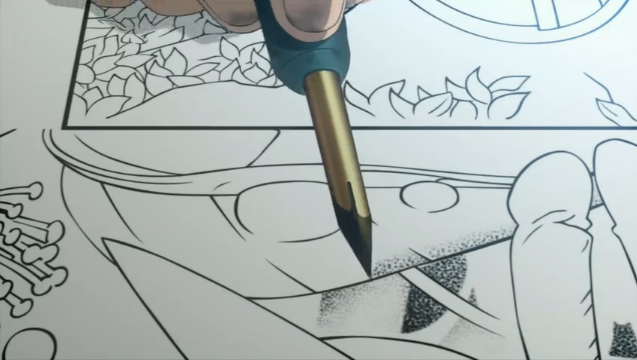 Aoki adds more action sequences, and her collaborator, Nakai, uses the stippling technique seen in the illustration above. From my perspective, this was about as good a development as could be expected. The use of real techniques to give them an edge grounds the shounen story form in something substantial. It is the rough equivalent of having Ippo practice his left hook in anticipation of the next fight. The generic story is always about getting to be #1, but viewers need something concrete to perceive the battle, else the show dissolves into a pastiche of scenes showing Kaya serving tea or curry to the boys. The technique of stippling involves layering lots of tiny dots in order to generate tone. Since each dot has to be applied separately, it is a time consuming technique. Thus Saiko is incredulous at first that Nakai can continue to use the technique if they get serialized. There are three alternatives: 1) wash, that is brush in a flat (black) ink, 2) pre-printed screen-tones, which are cut to fit, and pasted into place, and 3) hatching which is the use of lines alongside or across each other to generate tone. Of the four techniques, stippling is slowest except for small areas (when the overhead of cutting and pasting makes screen-tones slower. Wash is the fastest, but in printed works, such as manga, you can only generate a single tone (solid black). (BTW, Pointillism is a term that refers to using the stippling technique on the entire artwork, so that there is an absence of line or patches of any single color). Interesting. When they said “stipple” for a second I thought that was some kind of random verbal tic, before I realized it was an art technique. Any idea what mangas these days use this technique? No, I don’t generally follow manga. The only one I read a lot of was Skip Beat, and going back and looking at it, I don’t see ANY stippling at all. Might just be the luck of the draw, because I only looked at a couple of chapters. It is a time-consuming technique, so I guess it is infrequently used, so it was a pretty good device to use in a Bakuman plot.